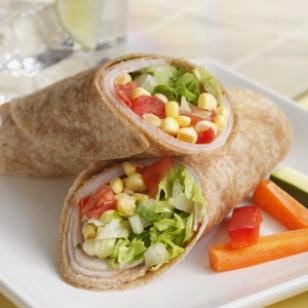 Back to school time is the perfect opportunity to start packing a healthier lunchbox with these healthy kids lunch recipes and kids snack ideas. Our easy lunches for kids are quick to pack, especially our bento lunchbox recipes. 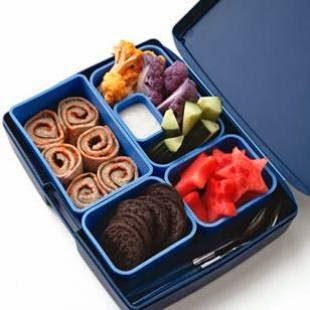 Pack our Pizza Roll-Up Bento lunch for a healthy kids lunch your child won’t be willing to trade! 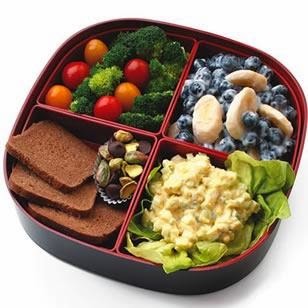 This egg salad bento box is a hearty lunch and snack all in one. Spoon the egg salad into a lettuce “bowl” to keep it looking pretty and enjoy with cocktail bread and veggies. Toss banana and blueberries with yogurt to keep the bananas from turning brown. Save the chocolate chips and pistachios for an afternoon pick-me-up. Watercress acts as a tasty divider between the salmon salad and crackers. Multicolored peppers and grapes add color to this bento and boost your daily servings of fruits and veggies. If you want to give this a fancy name, call it a crustless quiche. For a vegetarian version, simply omit the Canadian bacon. Tofu, rice and vegetables are classic bento ingredients. Make extra rice for dinner and roll leftovers into balls for lunch. To keep green veggies vibrant and crisp, cook them briefly and immediately dunk them into a bowl of ice water. You can also use cubed store-bought baked tofu in place of the roasted tofu. This streamlined version of a northern Italian idea is perfect for a summer evening: no-fuss, no-cook and big taste. You can even make it ahead and store it, covered, in the refrigerator for several days. If you do, use it as a wrap filling for the next day's lunch. Stirring salsa into versatile canned refried beans makes a quick and healthy bean dip. It also works well as a sandwich spread with your favorite vegetables and a sprinkle of cheese. Give this childhood treat a savory twist by swapping the peanut butter and raisins for cream cheese and olives. For a spicy snack, try chopped pickled jalapenos instead of olives. A graham cracker smeared with Nutella and topped with banana and coconut is a light way to satisfy your sweet tooth.